I am trying out ColorSchemer Studio on a 15-day trial at the moment and it seems to be a very useful little application. 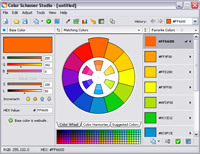 At its simplest, the software makes allows you to choose a base color and devise color schemes around this, based on common color relationships. There's more to this software though and I particularly like the ability to see a mini-preview of a web page color scheme. I also like the functionality where you can create a color scheme based on a photograph [below]. Very nice. 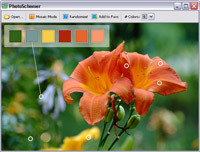 The ColorSchemer website allows you to create an account to view and share color schemes with other users. In fact, that's how I found about about the software. I saw one of Natalie Jost's color schemes on her Standards For Life website and clicked through. Thanks, once again, for the heads up here. The ability to build colour schemes pulled from colours in a photograph looks really interesting. I might just be looking into this one.